For those of you in or around St. Louis, you might check out the Chantal Ackerman exhibit, “Moving Through Time and Space” at the St. Louis Contemporary Art Museum. It opens tonight and runs until August 2, 2009. It’s a rare (and free!) opportunity to see the work of one of the great sleeper-hit avant-garde filmmakers. I'll try to be there, but if I’m not I won’t be able to see it for at least a couple of weeks, because I’ll be merrily tromping about in London and Belfast. (So don’t expect any posts for a while!) I’ll try to put up some sort of update after I have a chance to check it out. The works in this exhibit include “From the East: Bordering on Fiction” (1995), “South” (1999), “From the Other Side” (2002), “Down There” (2006) and “Women of Antwerp in November” (2007). Several of these combine multiple screens at once, like the screening of Andy Warhol’s “Chelsea Girls” (1966) that the contemporary did a while back. Ackerman, by contrast, is much more socially conscious. The exhibit brochure linked above begins its bio with, “Chantal Akerman is widely regarded as one of the most important directors in film history.” That’s a fairly bold statement that smells to me of museum propaganda, but it’s a shame that there are few chances for cinephiles to decide for themselves. Her work has rarely seen region 1 release (Update, 2010: Thanks to Criterion this is now no longer true. See comments section.) and is most often experienced through museum and university presentations. That said, my single experience with Ackerman’s work, a not-altogether pristine bootleg of “Jeanne Dielman, 23 quai du Commerce, 1080 Bruxelles” (1975), impressed me a great deal. 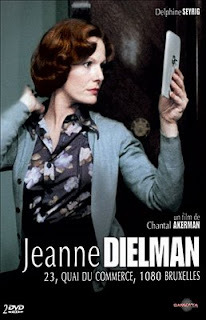 “Jeanne Dielman” is Ackerman’s most famous work and is rightly cited as a landmark of both feminist and experimental cinema. It’s self-assured, challenging, controversial, intimidating and so arty it explodes if brought into contact with summer blockbusters. The plot, what little there is of it, consists of a day-to-day, often minute-by-minute, visual transcript of a single mother’s life, presumably the Jeanne Dielman of the title (played by the wonderful Delphine Seyrig). The film’s structure is as rigid as its protagonist’s routine, relying on long static takes only occasionally broken by rectilinear editing. We watch Jeanne Dielman cook, clean, shop and prostitute in uninflected, somber semi-silence. So I hope you can appreciate the level of cynicism with which I approached “Jeanne Dielman” and the surprise when I found myself actually drawn into its rhythm. This is a very difficult work and I admit that I found my attention drifting and my opinion wavering throughout; even to the point where at times I started pre-composing the pithy smackdowns I planned to issue should I write a review. Ultimately I came to see its point and, more importantly, to feel that the point was not trivial (as it is in, for instance, Andy Warhol’s 8-hour shot of the Empire States Building). Yes, “Jeanne Dielman” purposely bores us, intentionally repeats things and stubbornly refuses to give us emotional catharsis or intellectual access with regard to its lone protagonist. But there is something powerful in the way it accomplishes both detachment and intimacy. A certain camaraderie builds up as we share Jeanne’s stifling monotony and one traverses a range of reactions through recognition, resentment and resignation that allows us to empathize with her existence in a way that is not possible in packaged entertainment or even traditional tragedy. Our ability to distinguish details is, at times, heightened by the length we spend staring at flat mundane slices of her lower-middleclass apartment and at the same time diminished as our vigilance (trained by traditional cinema to expect cues telling us what is important) gradually wanes. Ackerman plays on this softly, by gently introducing glitches into the well-established pattern. These deviations during our third day within Jeanne’s world, at first as minor as dropping a spoon, build towards a brutal climax. It is an ending both unexpected and yet foreshadowed by hours of uncomfortable, almost subconscious, tension. Far from being lazy, Ackerman’s film is painstakingly crafted to deliver a mixed reaction that is actually insightful, nuanced and just as compassionate as it is cruel. I’m not sure I fully appreciated the film or that I was paying enough attention by the final third to understand the ending or that I’d ever want to see it again. I know that doesn’t sound like a rave review, but if you have the right mix of patience, open-mindedness, curiosity and masochism, then this is a film that may yield unexpected rewards. Note: In case I did not make it clear, “Jeanne Dielman, 23 quai du Commerce, 1080 Bruxelles” is not one of the films showing at the Contemporary. In case the review only scared people off, I’m told the works at the exhibit are shorter, more accessible and more documentary in approach. So I made it out to the exhibit with my two sisters and a friend. The multi-video displays were definitely the most engaging. "Women of Antwerp in November" features black and white and color screens (1 large and 4 smaller on the opposite wall) depicting scenes of women smoking. It has wonderful atmosphere and texture (like very fashionable vintage noir) with a intuitive feel for mystery and sensuality, but not a great deal of meaning or substance as far as I could tell. It certainly succeeds as a collage of themed images, but I doubt many stay through the full 20 minute loop. The next two rooms contained "The Other Side" a series of snippet on over a dozen flat-screens that contain a narrated documentary on illegal immigration. The directness of the approach and the experience of walking through film as an actual journey through space was an excellent metaphor and Ackerman makes strong symbolic and literal use of the wall running along the US-Mexico border. The audio, which emanates independently from each TV interferes with itself too much to add much, especially amidst the noise of the opening night crowd. I may have to return to experience "The Other Side" fully, but it definitely worked on a viceral level. My favorite piece was a similar 24-screen room called "From the East: Bordering on Fiction" which was described as an exploration of Ackerman's East European Jewish identity. It is largely expressed through graceful tracking shots showing crowds of people standing and waiting around on streets, in train stations, etc. The juxtaposition of people, camera movements and old world settings made for arresting combinations, perhaps coincidental, but no less striking for being so, that held me for longer than the other displays. From reading the expressions in the grim crowds to observing the way lighting lends different emotional weights to similar scenes, there was plenty to ponder in the long, spacious gallery. Anyway, it's well worth the visit if you are in the area. Chances to see Ackerman's work are not likely to come this way again anytime soon. What an appropriately avant-garde rating. I did manage the exhibit tonight and took along my sisters, who are in town for my brothers graduation from Webster, and Josh Potter. I'll post an update with a mini-review of the show. Made a correction: Ackerman does have a couple films on region 1 release: The Captive and Tomorrow We Move. My bad! Good news! Criterion will be releasing Jeanne Dielman on Aug 25th. It's enough to make me seriously consider seeing it again.